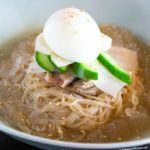 Let’s make some popular Korean summer noodles – Mul Naengmyeon! 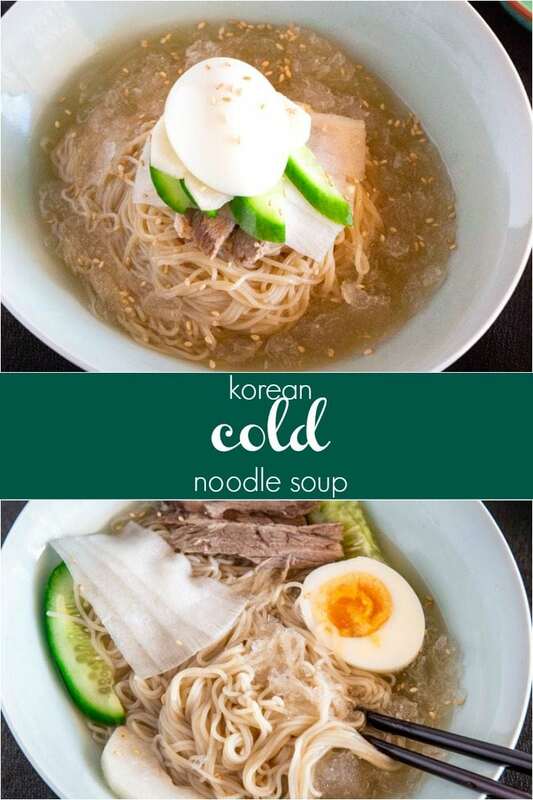 These noodles are served in icy cold broth and will help you forget about hot and humid summer weather! Mul Naengmyeon or Mul Naengmyun (물냉면) is cold noodles served in a chilled broth made from beef and/or Korean radish water kimchi (dongchimi, 동치미). 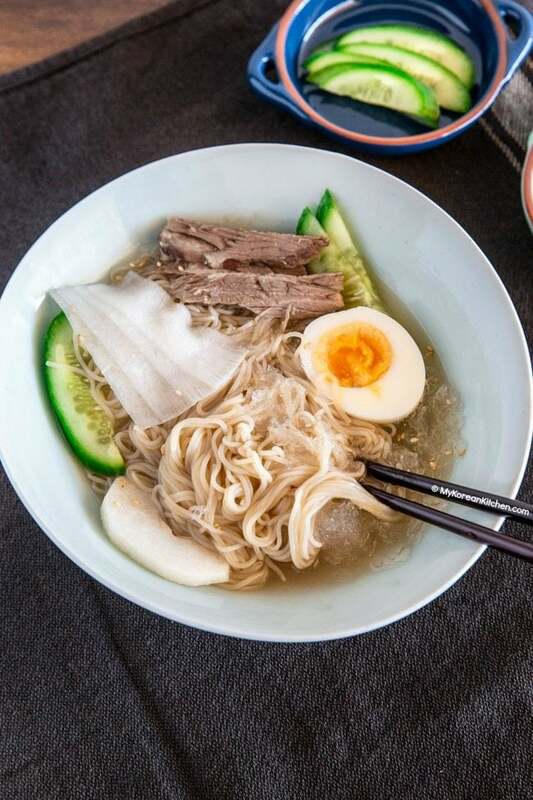 The noodles are also topped with sliced cucumbers, Korean pears, pickled radishes, boiled beef and boiled egg. These add subtle flavor of sweetness, tanginess and savoriness in between them. Overall the noodles have a very mild and refreshing taste and are somewhat moreish. 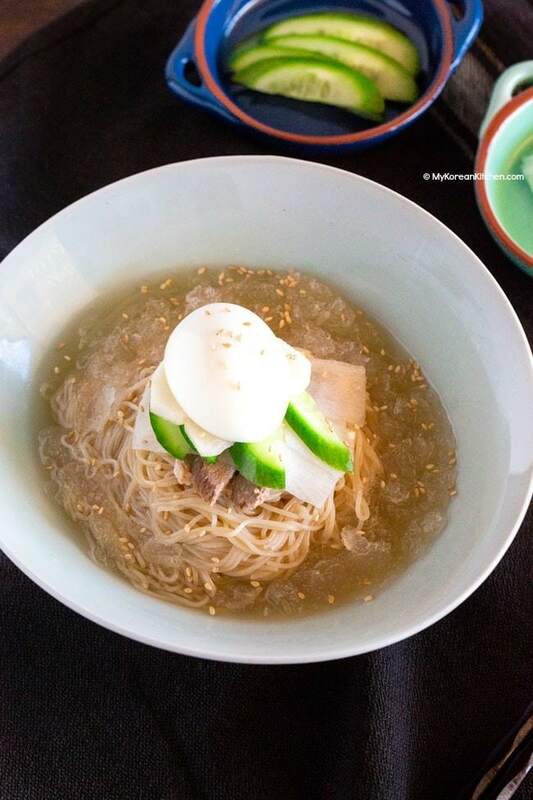 Naengmyeon was originally enjoyed during the winter months of Korea but it became a popular summer noodles. This makes more sense to me since the noodles and broth are served very cold! Another popular time to have naengmyeon is as you finish Korean BBQ. For sure, not everyone has spare stomach after doing Korean BBQ, but many Koreans order naengmyeon as their pre-dessert dish. Mul Naengmyeon has a sister noodle called Bibim Naengmyeon. Unlike Mul nangmyeon, those noodles are served dry (these’s no broth) and it’s quite spicy. Naturally, you will see some people preferring one over the other. I love them both, but I do love the spicy sensation the bibim naengmyeon gives me! I briefly mentioned that mul naengmyeon often uses dongchimi (radish water kimchi) soup as a naengmyeon broth. While it’s not a mandatory, if you truly want your broth to be refreshing, I believe it is a must! 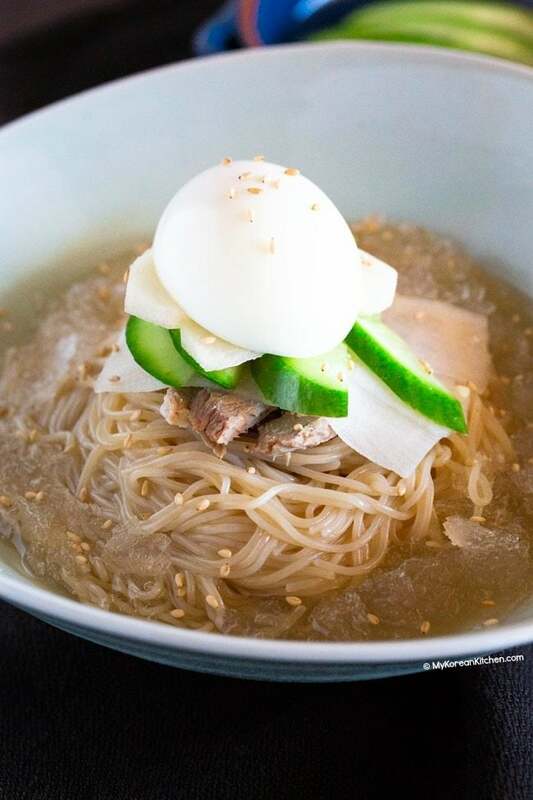 You can make the naengmyeon broth ahead of time and portion it then freeze it. These can last for a few months, so it can save your time hugely when the craving hits. If you’re feeling very lazy about cooking and preparing all these, you can also go with the instant versions. These are available from a Korean grocery store and can be found in the refrigerator section. Though, it does have some artificial sauce taste. Anyway, I hope you give this naengmyeon recipe a try soon! P.S. If you love noodles, check my other Korean summer noodle recipes too. 1. 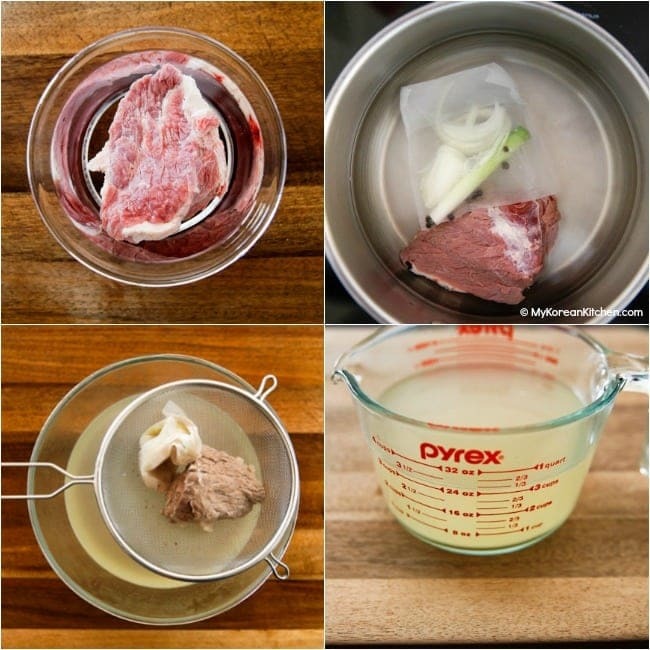 Soak the brisket in a bowl of water and set aside for 10 mins to draw the blood out. Drain the water away. Add the water (4 cups), brisket, onion, green onion and black pepper into a medium pot. Cover with the lid and boil it over high heat. Skim off any scum that forms. Take out the meat onto a plate and cool it down until safe to touch. Cut any stringy fat off the meat and thinly slice it. 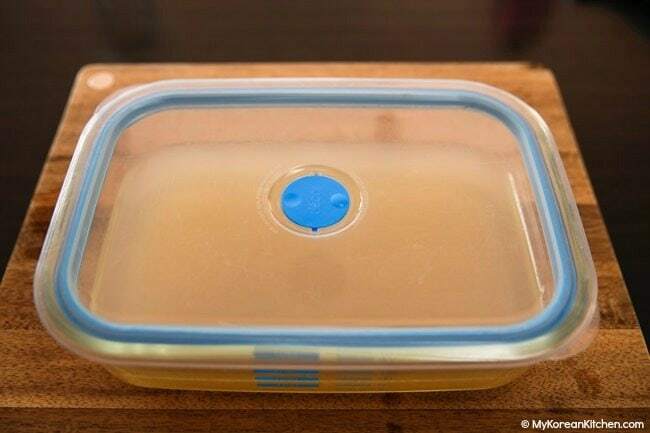 Cover the bowl / container and put it into the freezer and lightly freeze it (3-4 hrs). Alternatively, you can freeze it overnight and defrost in the fridge or at room temperature (if winter) until the broth is icy cold and slightly slushy when served with the noodles. If necessary, you can shave off the ice using a fork. 3. Boil the noodles following the package instruction. The noodles should be cooked well and the texture should be bouncy. Drain the water away and rinse the noodles under cold running water a couple of times to cool them down. If you desire, you can add some ice blocks while cooling the noodles down. Drain the water quickly and portion the noodles for serving. Place a mound of noodles into a serving bowl. 4. Pour the chilled naengmyeon broth over the noodles. Top it up with sliced beef, pickled radish, cucumber, pear and egg. Sprinkle some toasted sesame seeds. Serve immediately. For an extra zingy taste, you can add a little bit of mustard paste and vinegar into your soup. For convenience, I sometimes buy a packet of pre-pickled radish from a Korean grocery store (in the fridge section). It looks like this one. These pickles are normally used when you eat Korean BBQ. But its sweetness and tanginess is also just right as a naengmyeon topping. Alternatively, you can make these pickles referring to this bibim naengmyeon recipe. The taste of your dongchimi kimchi will affect the overall taste of the noodle soup. 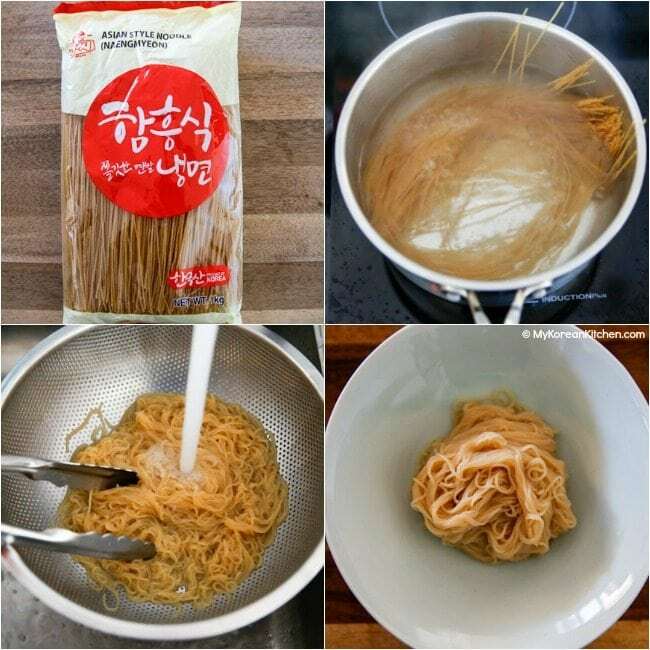 When you season the naengmyeon broth with vinegar, sugar and salt in step 2, be sure to taste the broth as you add those ingredients and adjust the quantity if necessary. It is advisable to make the broth slightly tangier and sweeter than your preference as once you serve the noodles, the overall taste of the broth usually gets diluted. Soak the brisket in a bowl of water and set aside for 10 mins to draw the blood out. Drain the water away. Add the water (4 cups), brisket, onion, green onion and black pepper into a medium pot. Cover with the lid and boil it over high heat. Skim off any scum that forms. Boil the noodles following the package instruction. The noodles should be cooked well and the texture should be bouncy. Drain the water away and rinse the noodles under cold running water a couple of times to cool them down. If you desire, you can add some ice blocks while cooling the noodles down. Pour the chilled naengmyeon broth over the noodles. Top it up with sliced beef, pickled radish, cucumber, pear and egg. Sprinkle some toasted sesame seeds. Serve immediately. For an extra zingy taste, you can add a little bit of mustard paste and vinegar into your soup. This is great – I’m so glad I found your blog, I’ve been wanting to try this dish for a while. Thanks for sharing this guide! Oh, I bet this is really good. And sort of refreshing since it’s cold. I’m excited for your trip – I’ve never been to Seoul!